As someone who has worked in golf, and been around golf for several years, there is one thing that I have come to realize. Just about everyone plays golf. That is none the more evident on the PGA Tour than at the annual AT&T Pebble Beach National Pro Am held in the beginning of February. It is one of the most fun events on the PGA Tour calendar each year for a couple of reasons. The first, is that it is played at Pebble Beach, among other course throughout the week. But Pebble Beach is almost considered hallowed ground when it comes to golf. With it’s breathtaking scenery and rich history, there are few places in the world like Pebble Beach. But what is special about the AT&T Pebble Beach National Pro Am, are the celebrities and athletes from all over who come to participate. Participants in the Pro Am are football players, actors, hockey players, baseball players, basketball players, and more. All of them have reached the pinnacle of their own sport, yet consider golf as one of their passions. Some of the players in the Pro Am this week include Aaron Rodgers, Tony Romo, Brian Kelly, Wayne Gretzky, and Bill Belichick. Most of you probably recognize those names without me even having to tell you where they come from. And then of course there are the regular participants like Bill Murray, Andy Garcia, and Ray Romano. It’s a chance to see these people outside of their element, trying to tackle a game that they respect very much, and have an appreciation for those who are at the apex of golf. It’s also a great event for the fans. They get to watch the players on the PGA Tour like Phil Mickelson, Dustin Johnson, Brandt Snedeker and plenty more. But in addition to that, it’s fun to watch these celebrities try to tackle the the course for the week. This tournament continues to be one of the most popular on Tour. It’s appealing in itself simply for be held at Pebble Beach, but then you throw in the Pro Am and it makes even more special to the players and fans. Some of the celebrities we mentioned in the event this week also have pretty good golf games. Romo is a single-digit handicap, as is Rodgers. It’s enough for oddsmakers at BetOnline Sportsbook to set some of the celebrities in the tournament with head-to-head betting odds. We are used to seeing head-to-head odds for players on the PGA Tour, but this switches it up to the amateurs. We mentioned Rodgers and Romo for a reason, as they are paired against each other. Romo is slated as a -150 favorite on the moneyline to best Rodgers this week. It’s the first time in a while that Romo has been favored over Rodgers, because let’s face it, the Packers have been better than the Cowboys for several years now. At -150, every $1.50 bet on Romo to beat Rodgers will profit $1. Rodgers is set at +130, which means every $1 wagered profits $1.30 is he wins. There are several other head-to- head prop odds set as well. Notre Dame is going up against New England when Kelly and Belichick are matched against each other. On the football field it wouldn’t be very even, but these two head coaches are quite close on the head-to-head odds at Pebble Beach. Kelly is the slight favorite at even money, while Belichick sits at +120. It will be a nice consolation prize after the two suffered losses in championship games. 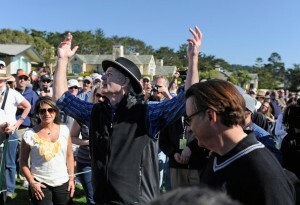 Check out the rest of the head-to-head Pebble Beach Celebrity props below. This entry was posted in Opinion and tagged aaron rodgers, andy garcia, at&t pebbe beach pro am, betting odds, bill belichick, bill murray, brian kelly, pebble beach pr am, phil mickelson, tony romo on February 6, 2013 by Bryan.